It’s been awhile since I’ve posted any of my travels. Here’s my answer to that childhood ubiquitous question. Spring blurred into summer, beginning technically on June 21 but really on June 2 when I traveled to Tucson for an outdoor family wedding. The weather was hot, we wore shorts and ate blizzards from Dairy Queen in the town of Sierra Vista, Arizona (stay tuned for more details on Bisbee and Tucson). In June, we took a trip to Provincetown and walked Boston’s Freedom Trail. We said good-bye to our Chilean exchange student, wondering when we would see her again, glad of the excuse for a future trip to South America. In July, my family was consumed and overwhelmed with learning about and planning for my daughter’s through hike of the Long Trail. We explored Vermont – Manchester, Waterbury, and Stowe and hiked through the Green Mountains. In August, we recovered from our Vermont travels with trips to the beach on Boston’s North Shore, bike rides, kayaks, and swims in local ponds. We listened to music at outdoor festivals, visited farms, ate lobster and pizza, and grilled. We picked flowers and basil and went for a ride in a plane. Now that fall is quickly approaching, I’m scrambling to get a bit more summer in. I need at least one more trip to the beach, and many more kayaks, bike rides, and outdoor swims. I need to shop at more farmer’s markets, eat lots of tomatoes, fresh corn, and peaches, grill vegetables, make fresh salsa, gazpacho, and zucchini bread. When the hot summer days cool off, I want to be ready. Ready to say good-bye to the heat and welcome sweatshirt weather and apple picking season, when I can still ride my bike and make apple crisp, and slowly get ready for fall. 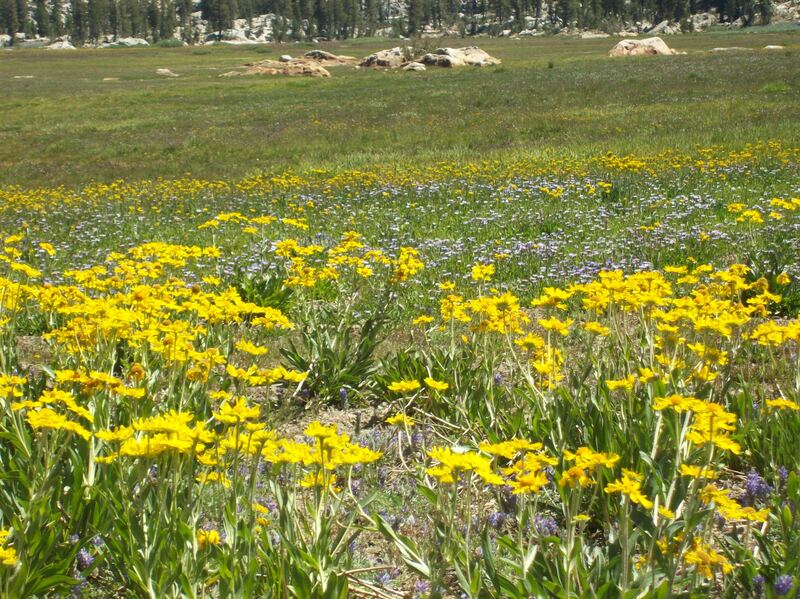 Our longest day was one of our easiest, as the 7 miles of trail wandered and wound through meadows of wildflowers: blue lupine, red Indian paintbrush and yellow monkey flowers. 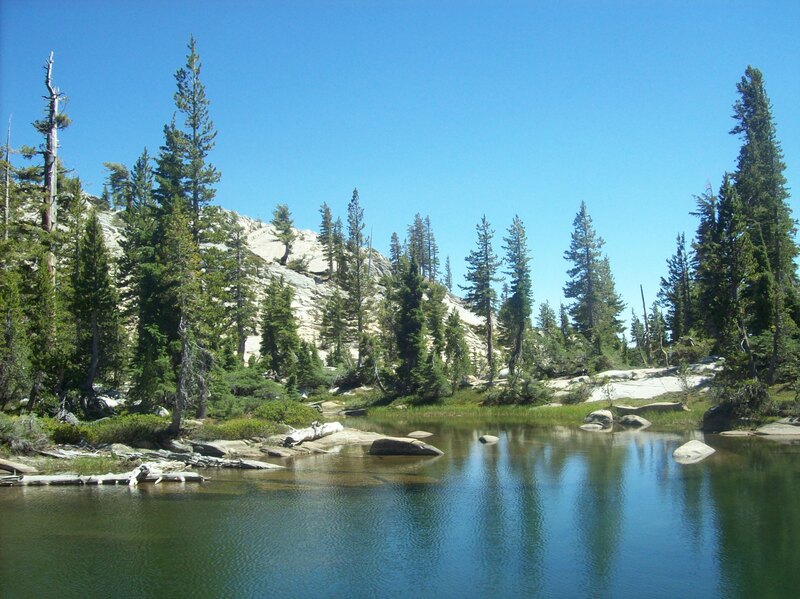 We spent the night at Y Meadow Lake, surrounded by granite without much vegetation. We scattered our tents about between the rocks and enjoyed the quiet of this unpopulated lake, the only sign of civilization, someone’s food hung high on a tree branch over the lake away from any potential hungry bears. We didn’t swim in Y Meadow Lake, but sat by its edge, doing crossword puzzles, reading, and relaxing. 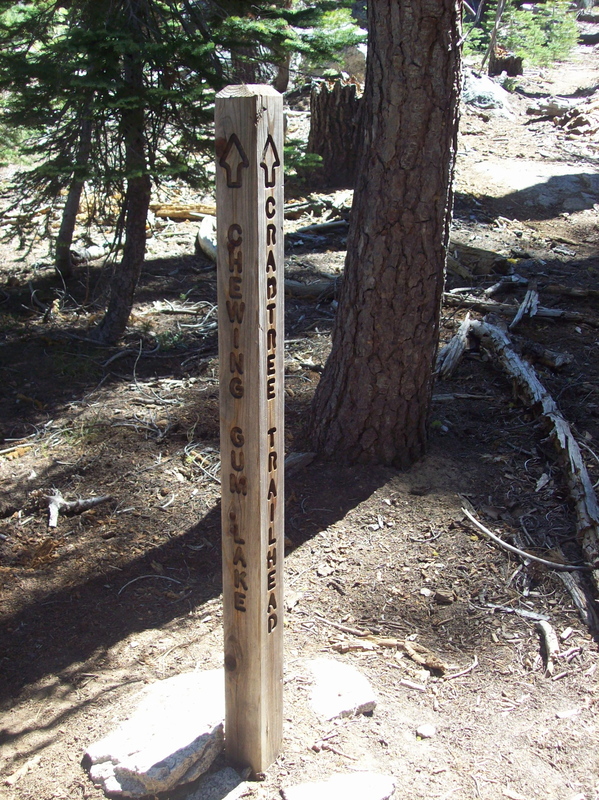 We spent our last night on the trail at Chewing Gum Lake and wondered how it got its name? Was it the muddy bottom that squished as our feet touched and sank several inches? Or was it the grey color of the mud banks? Motivated to get my feet off the mucky shore, I swam into the clear water and was soon gasping for breath. Surprised, I remembered the 8,700 foot elevation, pretty high for a flatlander like me. At Chewing Gum Lake we were not alone; the lake was scattered with people of all ages jumping off its rocks, swimming and sunbathing or just hanging out on air mattresses on the water. 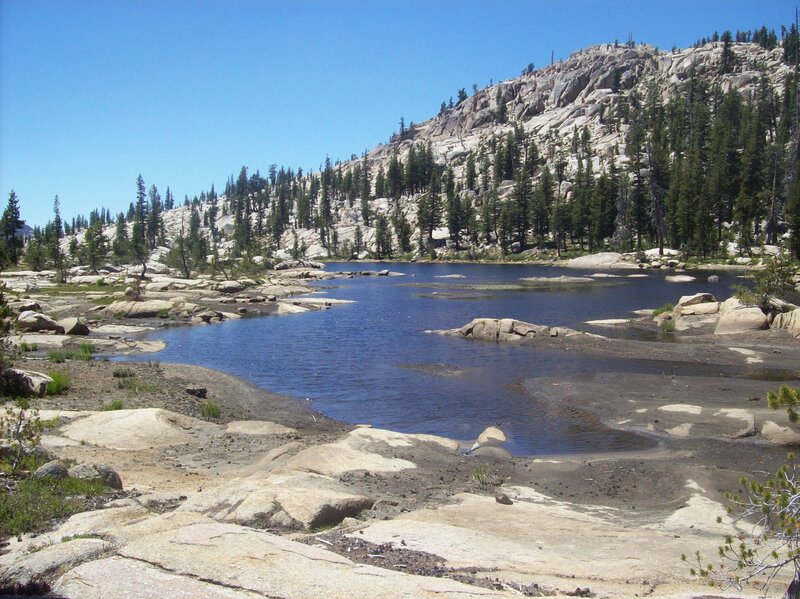 Just 4.5 miles from a trail head, Chewing Gum Lake was easing us back into civilization. Once again, the group campsite was taken, so we each found our own nook among the rocks of this hilly area, our kitchen located between a couple of trees. That night, as we stayed up late playing a game of Uno, needing head lamps to see our cards, we could hear other campers and smell their campfires. 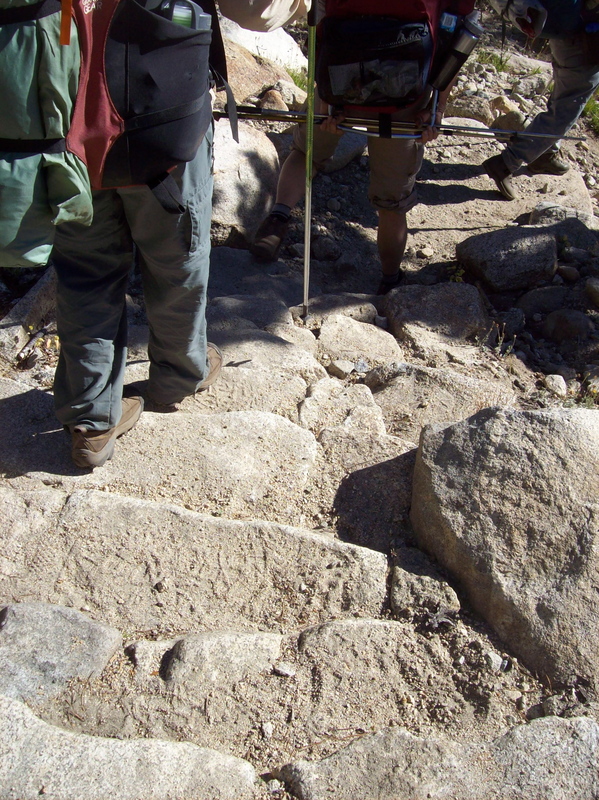 After peaking at 8,923 feet, we began our descent and hiked down to our beginning elevation of 7,200 feet. Our last day hike back to Crabtree Trailhead was quick, as our leader said it would be, referencing the Back to the Barn effect. Just like horses or cows, once we knew we were almost “home,” we picked up the pace and finished our hike in just 3 hours. Back at Crabtree, we exchanged addresses, took photographs, said good-bye and marveled at our trip where 11 strangers hiked and camped easily together, wildflowers were in abundance, mosquitos were rarely seen, and it never rained. We awoke at Gem Lake to what would be our coldest morning: the thermometer read 25 degrees. Although I wore a hat and gloves for breakfast, by the time we were ready to begin hiking, the sun was higher in the sky, and I’d shed my outer layers. On this trek from Gem Lake to Upper Wire Lake, only a 4-mile hike up and down, we encountered a family with a dog, Boy Scouts, and even a church group of youths learning to rock climb. 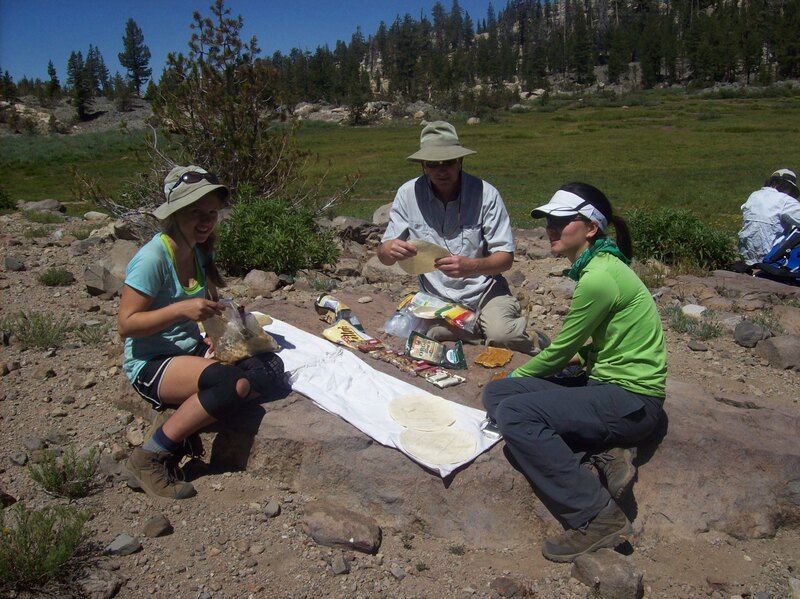 We hiked quickly, our packs lighter each day, and arrived at Wire Lake, our next destination, for a late lunch. After eating, we surveyed the area, looking for a place to camp. At first, Upper Wire Lake did not look promising. 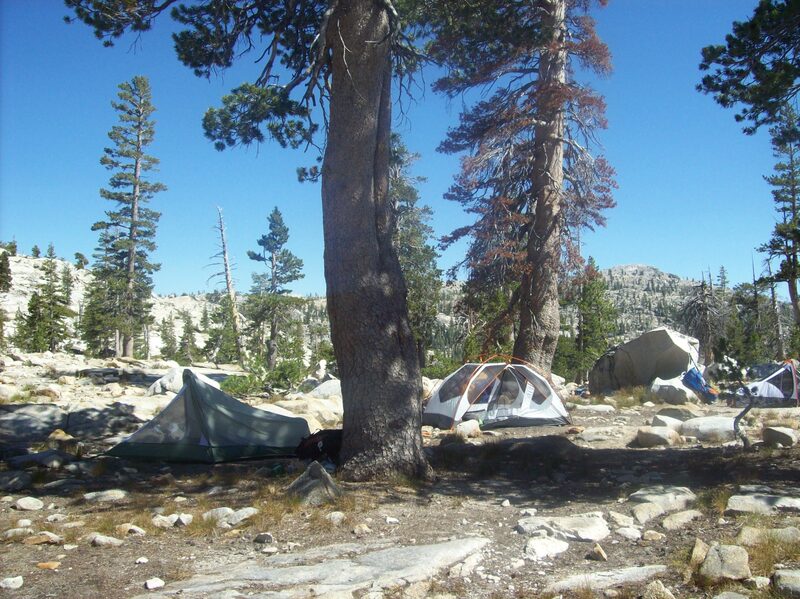 Much of the shoreline was rimmed by granite, the rest by woods or grassy meadows, the only group campsite already claimed. 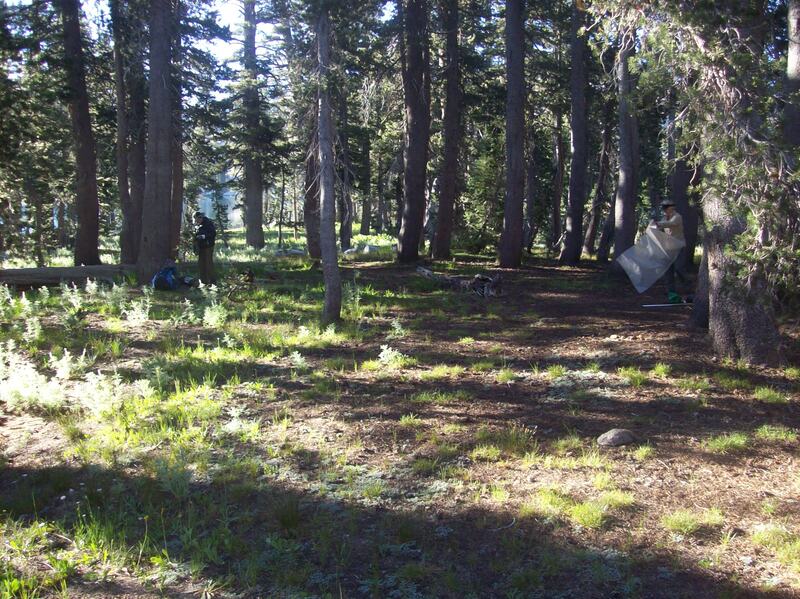 Following the Leave No Trace principles, we searched for areas void of new life to pitch our tents and separated. 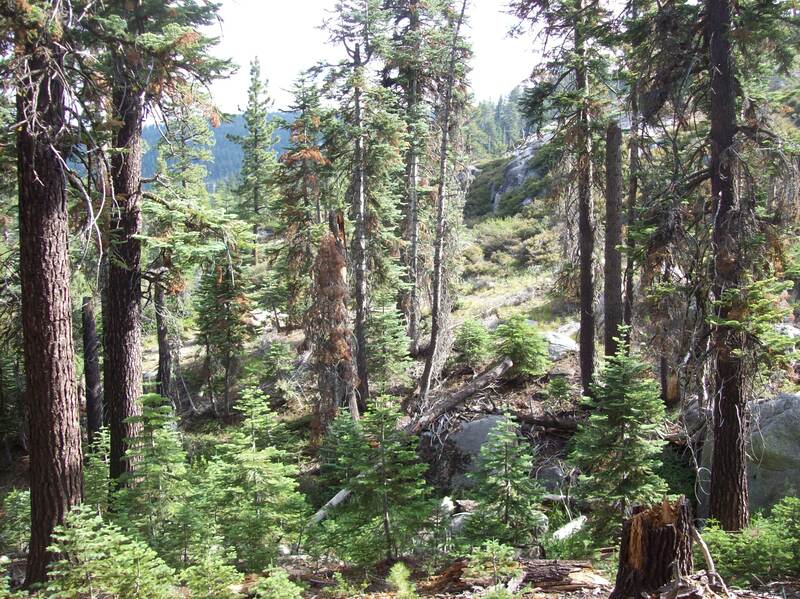 Beneath a grove of pines, I found a dirt and pine needle covered, somewhat flat area abutting a boulder strewn hill. 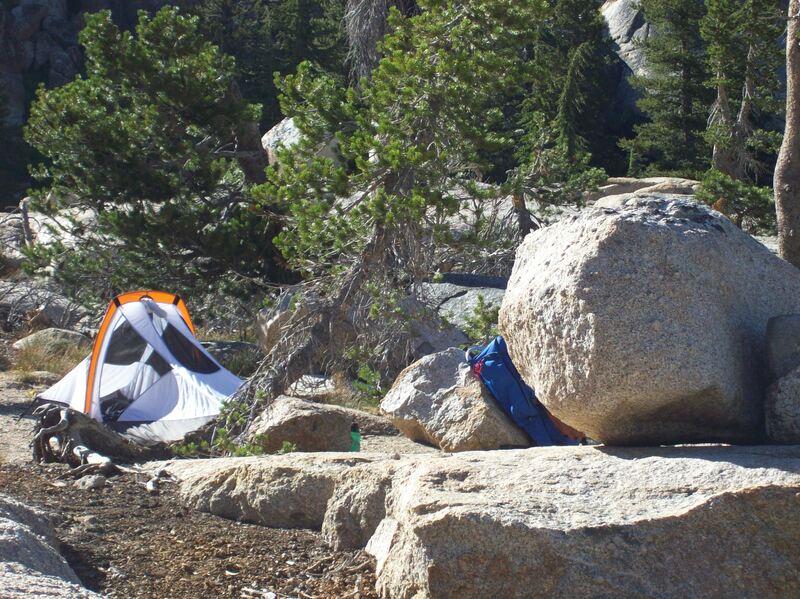 A few of us pitched our tents there while others found small crevices of dirt between rocks on the edge of the granite hill. Walking to our “kitchen” and communal area was more of a challenge at this site, as we bushwacked through pinecones, over rocks, and around fallen trees for each meal. 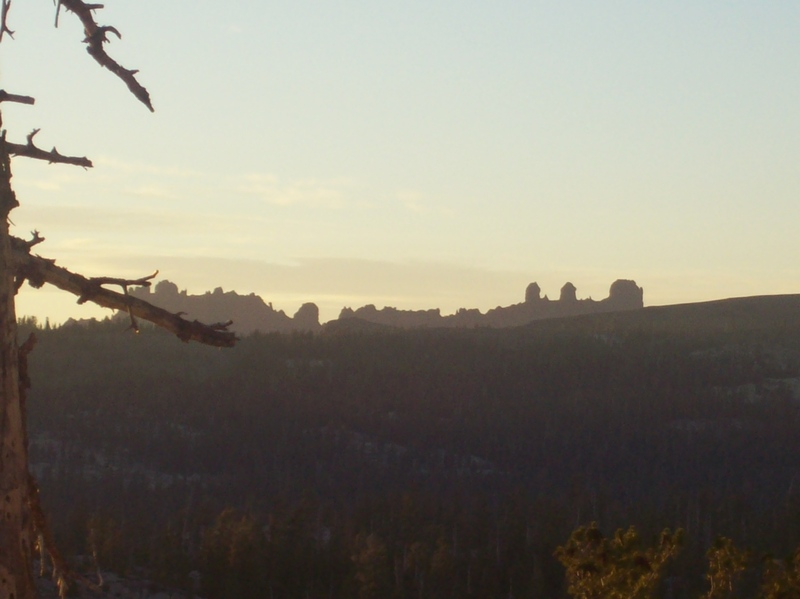 We hiked up the hill for the sunset, viewing the rest of the Wire Lakes and wondering at the castle looking rock formation in the distance. We spent two nights at Upper Wire Lake, exploring the shoreline and its coves, swimming out to a boulder then warming ourselves in the sun as the breeze picked up, and hiking to nearby Long Lake. On this morning only, we were able to sleep a little longer (until 7 a.m.! 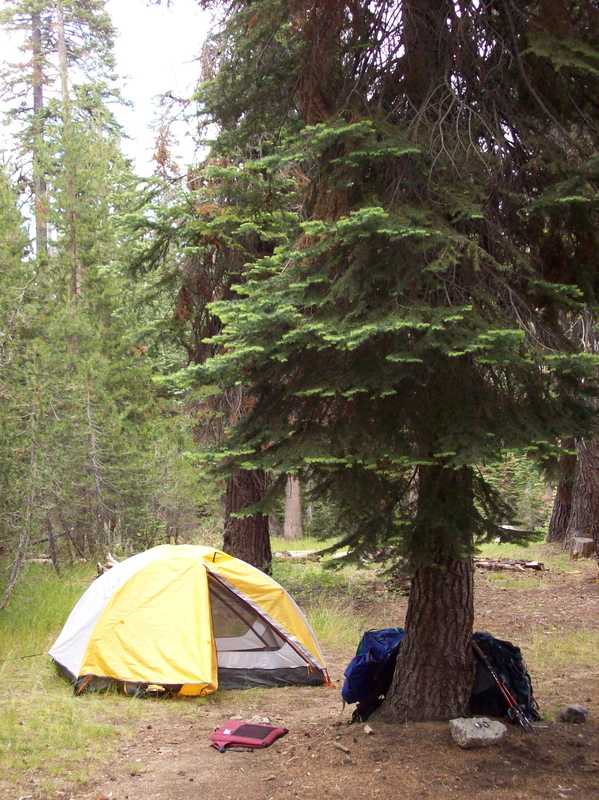 ), not hurrying to pack up our tents or our packs. We woke again early on our fifth day on the trail, said good-bye to Upper Wire Lake, and headed back on the trail. I started to fall and couldn’t right myself. With 40 or so pounds on my back, my center of gravity was off and I fell face first into the dirt. Fortunately, the dirt was soft and except for a ruddy face and smudged sunglasses, I was fine, just tired and a little embarrassed. We were at the end of a 4-mile hike from Lily Pad Lake to Gem Lake on the third day of our backpacking trip. 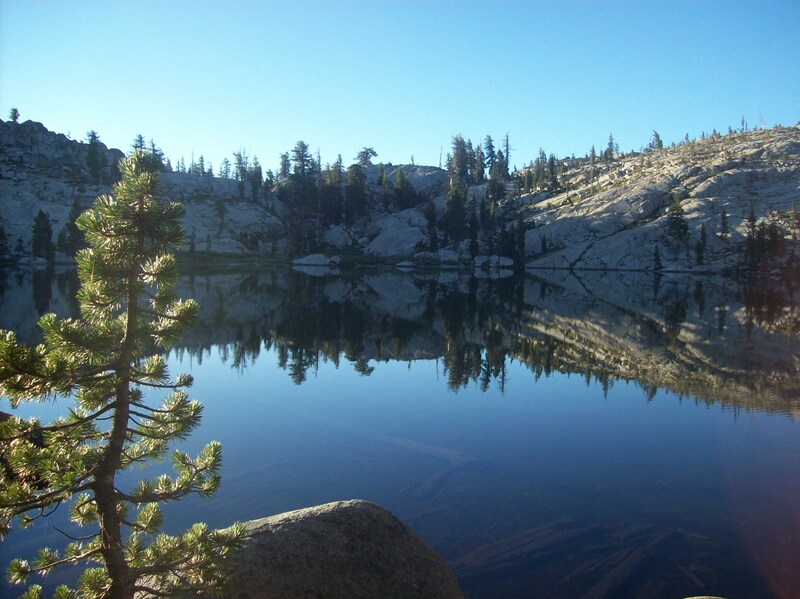 With its plentiful campsites, several small beaches and its clear, blue water, Gem Lake is a popular destination; and while we found the lake idyllic, others did too. 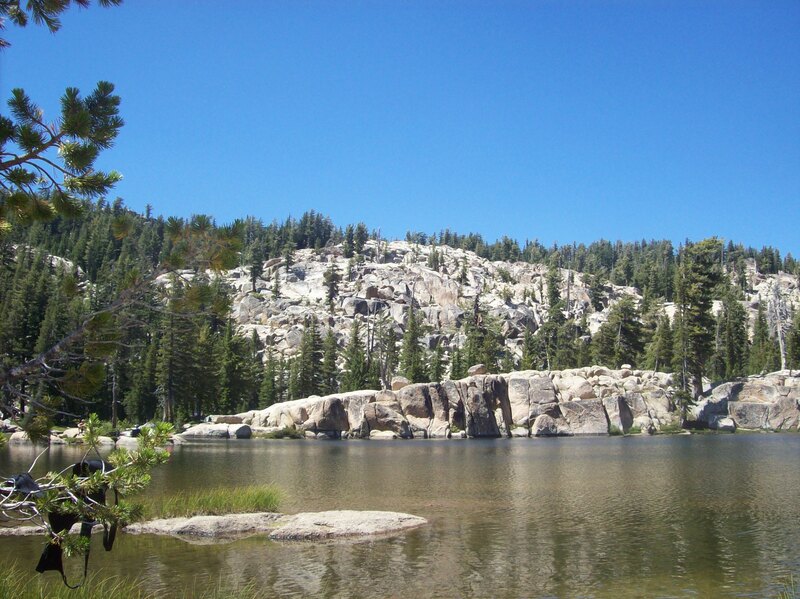 Their tents hidden behind boulders and lodgepole pines, we caught an occasional flash of red or green and heard swimmers yell as they dove and swam, a dog barking excitedly. Electric blue fireflies flitted around us as we relaxed on the warm rocks, talking and reading. 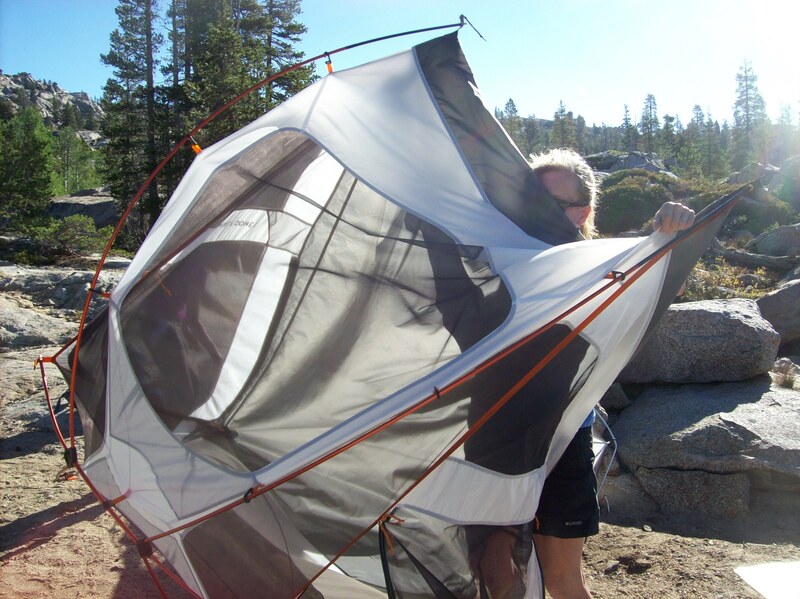 We slept without a rain fly that night and gazed at the stars through the screen of our tent. 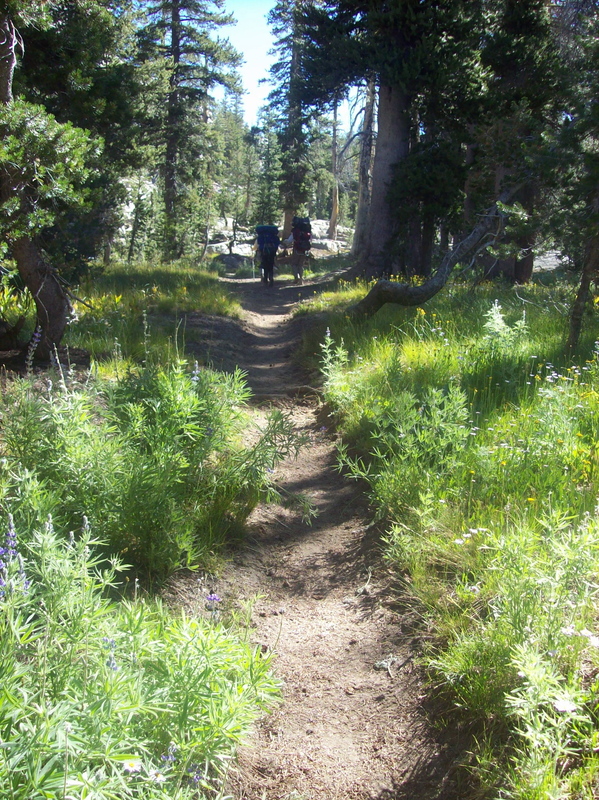 With our 45-pound packs on our backs, we began our journey about 8:30 a.m. and set out on the Crabtree trail in the Stanislaus National Forest before entering the Emigrant Wilderness. 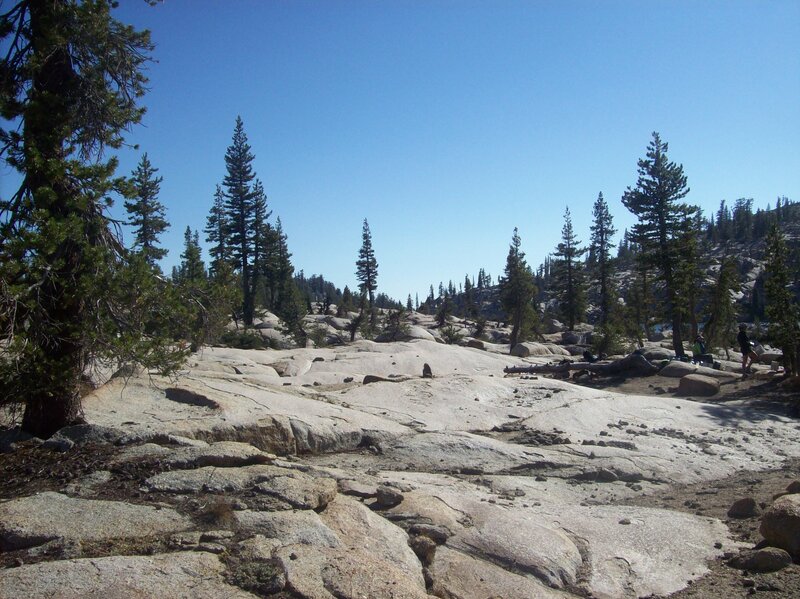 We climbed up and down steps made of granite, stopped briefly for a view of Camp Lake then up again and down a dusty switchback trail. 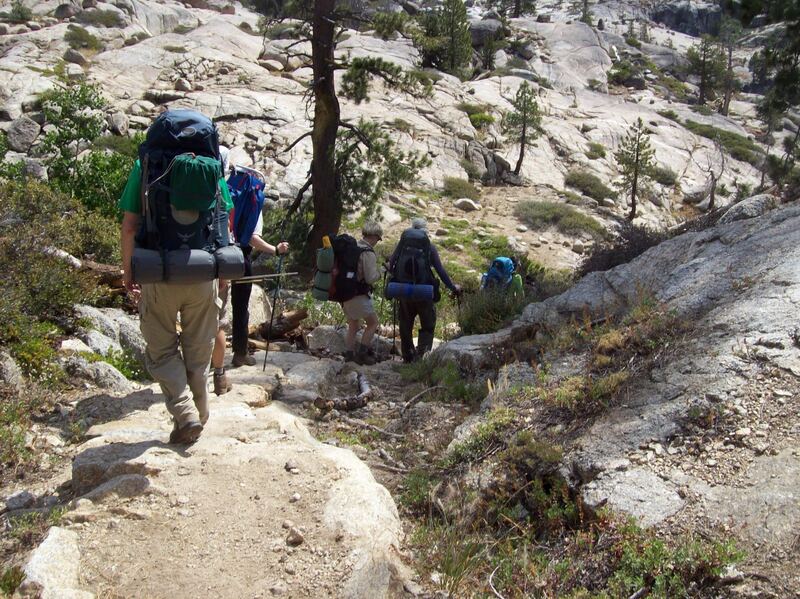 It was hot, our packs were heavy, and after a water and lunch break, our conversation stopped and we headed up again, each of us concentrating on the next step as our packs dug into our shoulders. 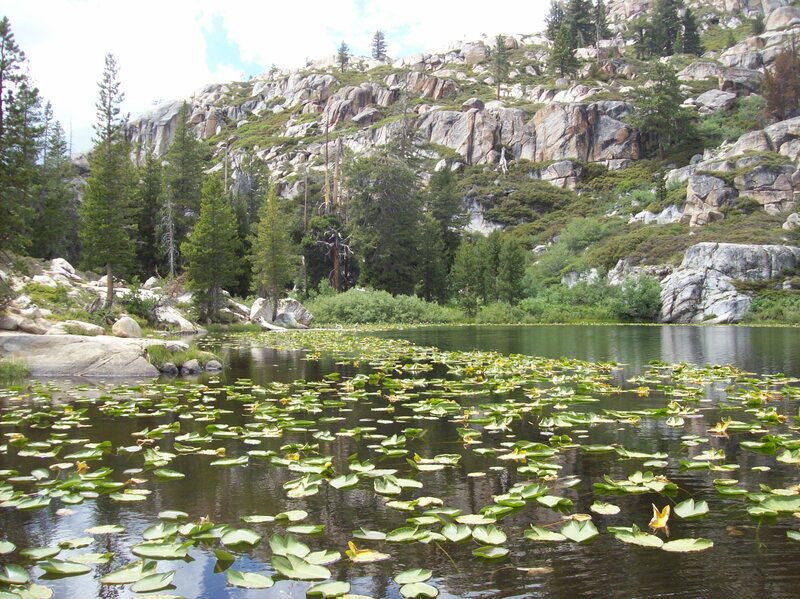 After 5 miles, we arrived at Lily Pad Lake, named for the abundance of lily pads on its surface. 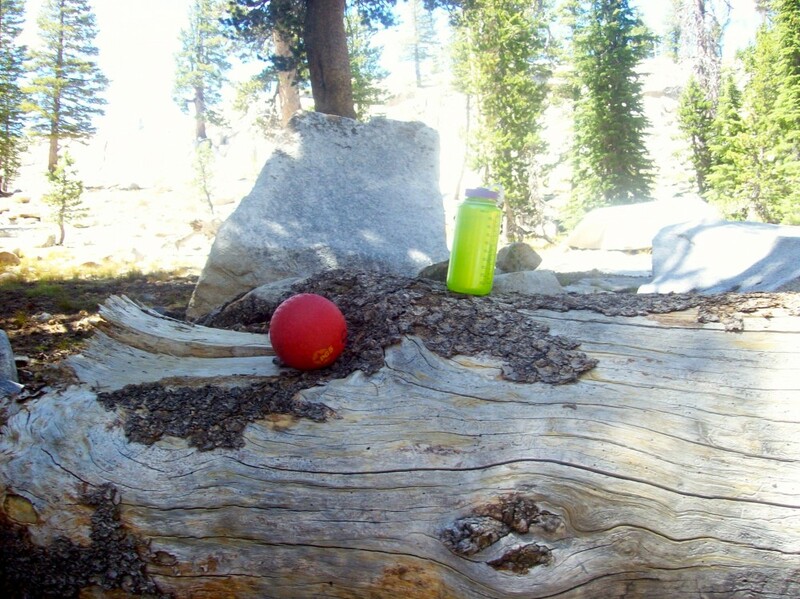 After setting up our tent, we grabbed our water bottles and headed for a large granite rock by the lake. We slid into the water, the lily pads preventing us from swimming but allowing us a small space to cool off. 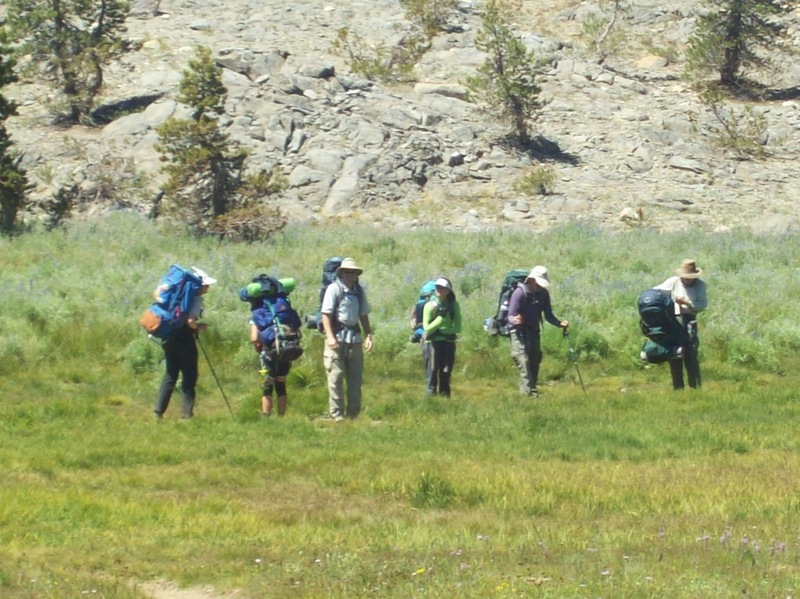 Refreshed, we joined our group for a Leave No Trace presentation by a volunteer of the Emigrant Wilderness and Stanislaus National Forest. 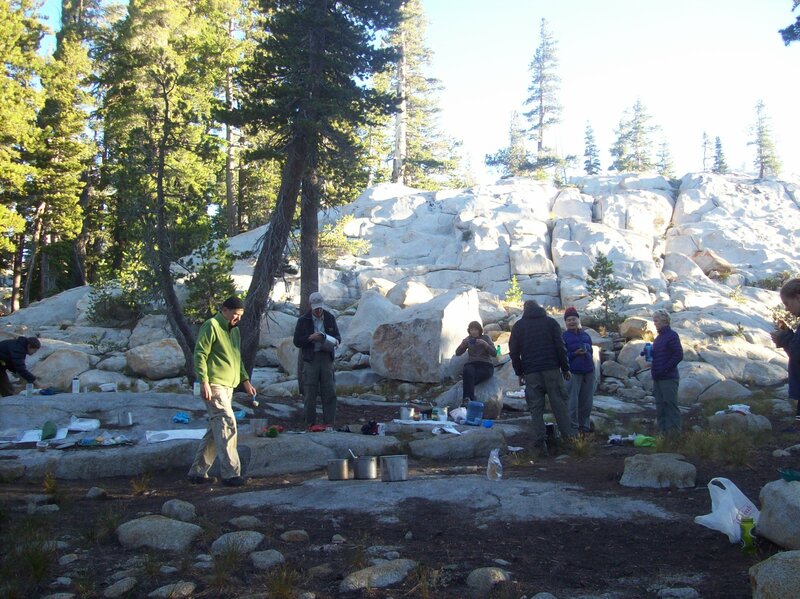 We learned that the seven Leave No Trace principles are: 1) Plan Ahead and Prepare; 2) Travel and Camp on Durable Surfaces; 3) Dispose of Waste Properly; 4) Leave What You Find; 5) Minimize Campfire Impacts; 6) Respect Wildlife; 7) Be Considerate of Other Visitors. On a large flat rock against a pink sky, one of our fellow backpackers spontaneously led us in yoga exercises. We fell asleep that night tired but relaxed. Have you ever chosen to spend a week of your vacation with people you’ve never met? 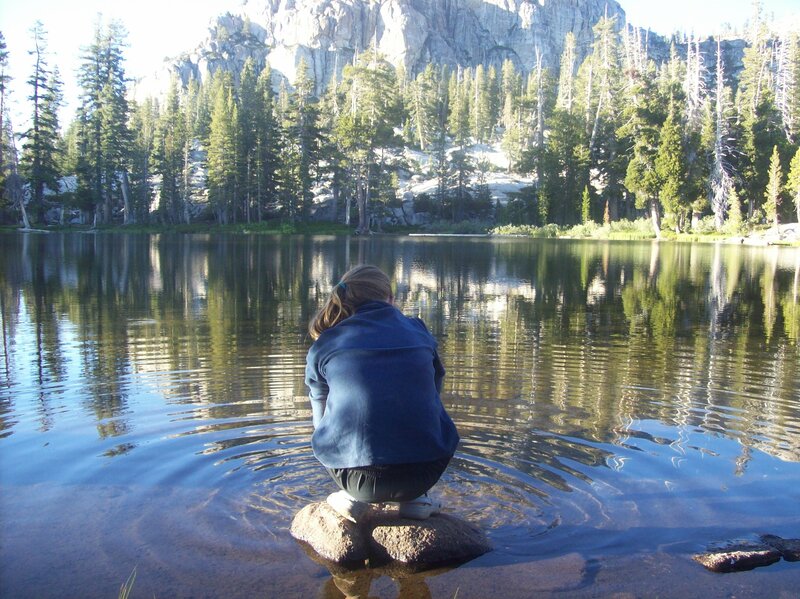 My teenage daughter and I signed up for a week long Sierra Club backpacking trip not knowing a soul. We met two of our fellow backpackers at the BART station in Walnut Creek, California, where we agreed to meet in order to carpool to the trailhead. 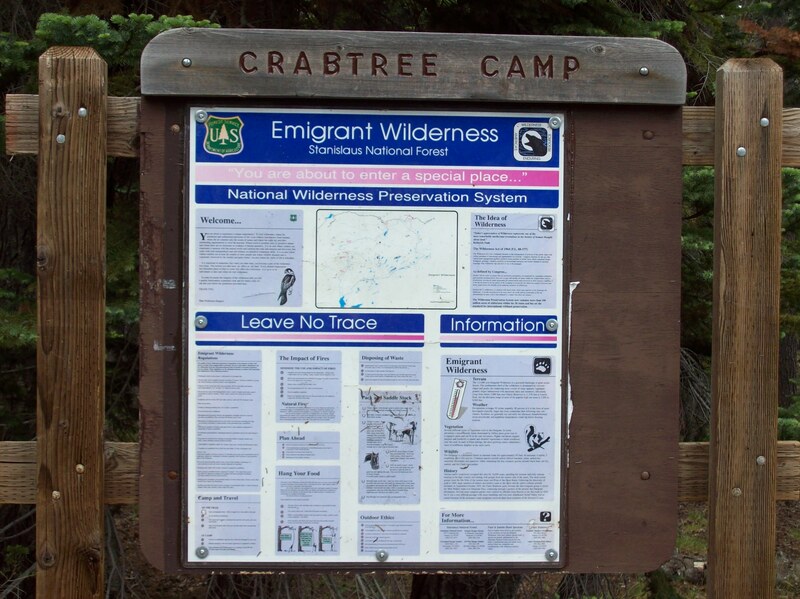 We met our leaders and the rest of the group at the Crabtree Camp in Stanislaus National Forest near Dodge Ridge Ski Area not too far from Sonora. Not only were there people from Northern and Southern California, there were backpackers from Alaska, Texas, Connecticut, and Massachusetts. We were teenagers and over age 65, men and women, married and single, backpacking for the first time or for the umpteenth time. Once everyone arrived, it was time to weigh in. 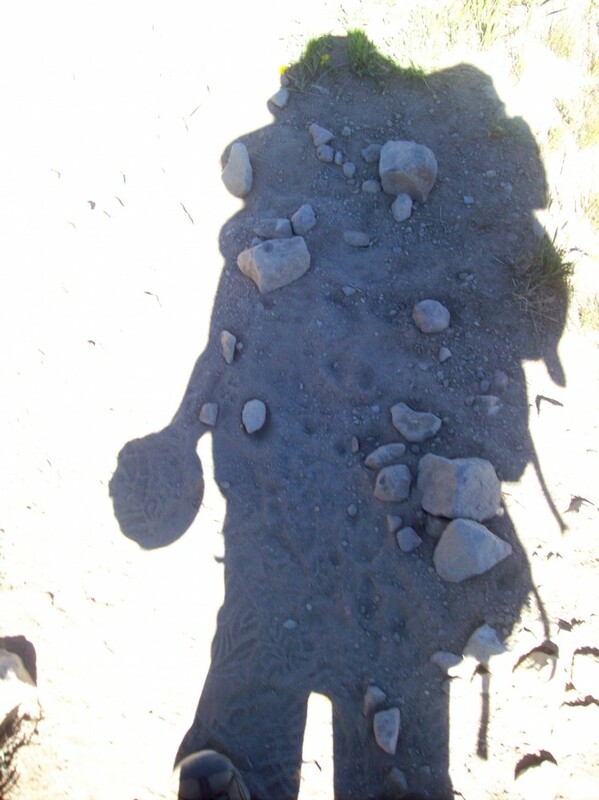 How much weight was I really going to carry on my back while hiking several miles at elevations of over 8,000 feet? After packing and repacking, adding, replacing and removing items, I did my best to keep the weight of my pack as low as I could. 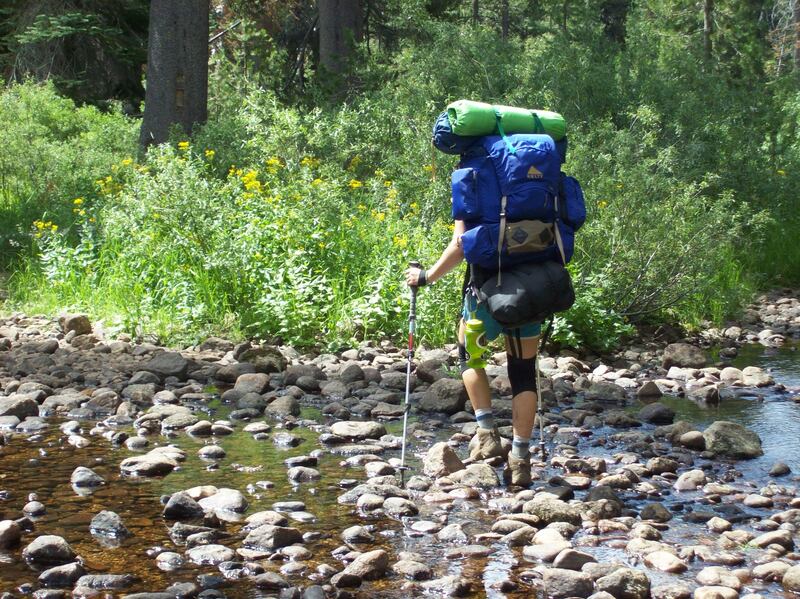 Our leader recommended we start with no more than 25 pounds, including pack, water, tent, first aid kit, and clothes for a week where temperatures could range from 25 to 85 degrees with rain or sun. 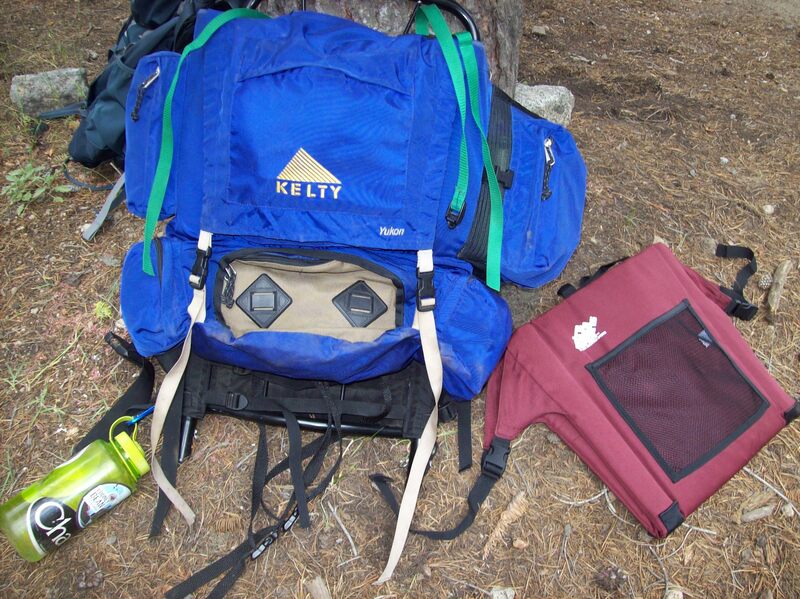 Each of us would add a bear canister, containing at least 15 pounds of food and cooking utensils, to our pack. One by one, we hooked our backpacks onto the portable scale hung on a pole next to the picnic table. In spite of my efforts (a fellow backpacker and I even split a book in half to share the weight), my pack weighed a hefty 28 pounds. That night we ate burritos and chatted around our only campfire of the week. We studied the map and shared experiences before heading to our tents for the night, ready to begin backpacking the following morning. 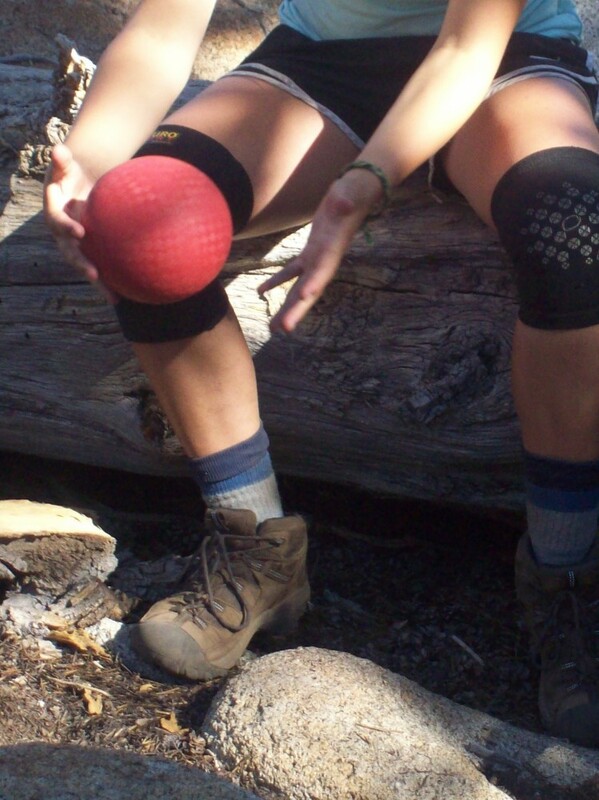 When my son and husband signed up for a Boy Scout backpacking trip in the Eastern Sierras, I was determined to find an equally exciting adventure for my daughter and me. And I did, without much searching. 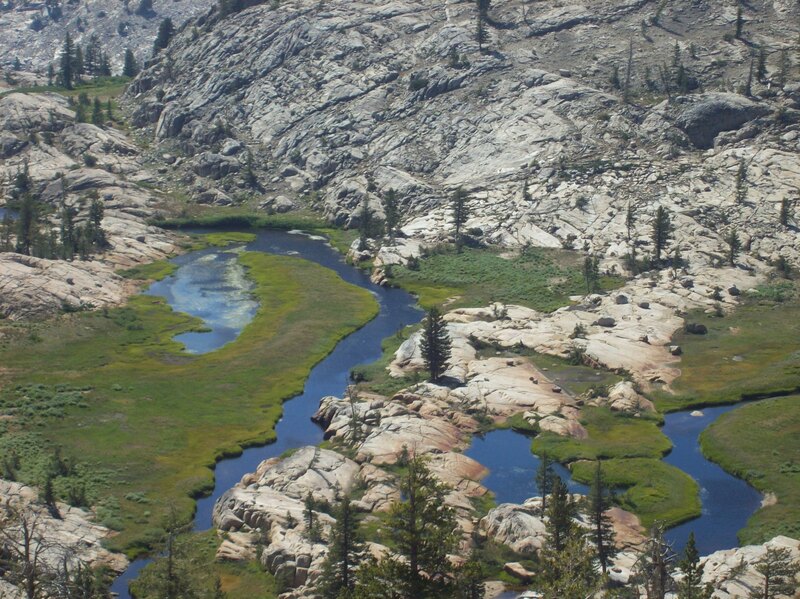 I was surprised to find a week-long gluten-free beginner’s backpacking trip offered by the Sierra Club in the Emigrant Wilderness just north of Yosemite. Since my daughter is gluten free and a beginner backpacker, and it had been over 15 years since I carried a pack, we signed up. Over the next few months, our leader changed from a woman with celiac disease to a woman who does NOT eat gluten free, and the trip description changed to a beginner’s backpacking trip.” We were given the option to opt out of the trip but were assured that my daughter and another backpacker would still eat gluten free, and they did. From burritos to quinoa to pasta with pesto or sundried tomatoes to lentils and rice, we all ate well. We ate granola, oatmeal, and scrambled eggs for breakfast; tuna, peanut butter and jelly, and cheese and crackers for lunch. At breakfast and lunch, while the rest of us ate cereal, crackers, tortillas, and pita bread containing wheat, my daughter ate gluten-free substitutes. Dinners were gluten free for all. The trip was great, she was never sick, we were introduced to a few new gluten-free products, and the rest of our 11-member group learned a lot about eating gluten free and preventing cross contamination between wheat products and gluten-free ones.